Your search for a modest prom dress or a modest formal dress should include a visit to LatterDayBride & Prom. The company's online gallery displays dozens of cool prom dresses, from short, knee-length bubble dresses, to tiered long dresses. The company's offerings reflect many very popular styles, but with the inclusion of sleeves and modest cuts. You'll see corset-style bodices with rhinestones, empire waistlines, tea length dresses and more. The colors are also very contemporary, including burgundy, turquoise, hot pink, fuchsia, lime, black, lavender, and several "shimmer" colors which seem to reflect light in patches of bright gradients. 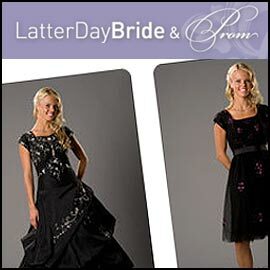 LatterDayBride & Prom's website invites visitors to "Discover the prom dress you won't see anywhere else."